Now I'm using a NAD 1020a which does everything aI need w/ the exception of a working remote. This unit not remote compatible. Requirements are Phono stage, tuner in, and either dedicated cd or aux to do the same thing. Getting lazy in my old years and would like a working remote to change inputs. So forumites any ides and as you know I'm one poor due,wa wa wa wa.So price is an issue. $200 + shipping will get you my extra Yamaha a-s501integrated with remote. Nearly new. Add a chromecast Audio $35, connect to the integrated dac and your good to go. I have a Sherbourn Pre-1 with the remote that has about 50-75 hours on it. It doesn't have the bass management that the earlier ones did. It's in like new condition. Has balanced and RCA outs. $200.00 + shipping. I upgraded to a P-5. 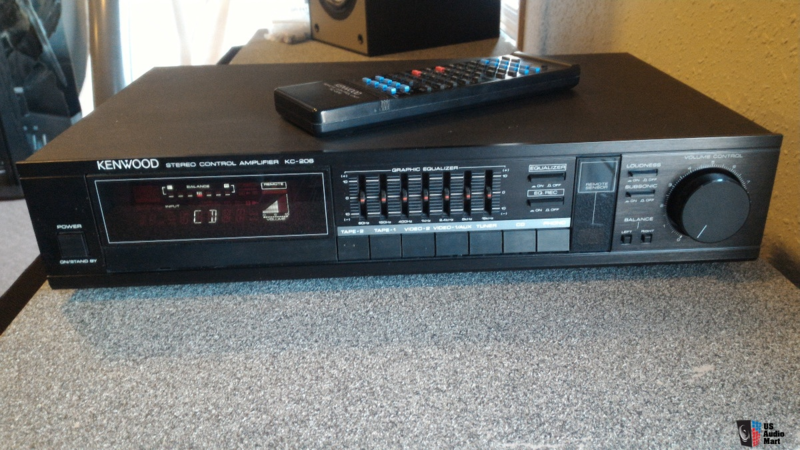 A mint Adcom GTP 450 with remote no phono preamp $125 shipped, have others but no remote. Includes phono input, digital inputs, subout, stylish Yamaha looks, and 4ohm stable. Glad to see that you seem to be liking the P5! I've got an AMC pre. Has a phono stage but no remote. It's just hanging out in the closet. I used it for a bit when my receiver kicked the bucket and I waited for a new pre. Anyway, $75 and we can split shipping. If you're interested PM me. so is the NAD 1020a going up for sale then? No, the 1020a is so good I would keep it as back up. The Yamaha I will look into. It seems the earlier pres did not have remotes until the later Onkyo P models and all the other Japanese examples. How do they compare lets say w/ an APT-Holman and others of that vintage w/ the newer ones w/ remotes. I found that the weak link to the Onkyos was their amp output female jacks that loosened over time. Again guys don't bother w/ pres that do not have a tt input. That's a tall order in a pre on the cheap Lew. You might have to prioritize your needs. Separate phono pre's are cheap these days and it may be better to acquire a pre without one and simply add a separate phone pre to it. Then again, I have to ask....why are you spinning vinyl still anyway ? If your trying to do things on the cheap, cheap and vinyl don't belong in the same sentence. Digitalize those albums, put them in a lossless format on the computer/hard drive and stream them to a dac/pre. Depending on what you use to stream, you'd have a remote in the palm of your hands to control and access all your music. The pre wouldn't even need a volume remote. To me anyway, and considering your knee problems, budget concerns, digital is right up your alley to simplify things. Cheap basic preamp with remote = Kenwood KC-206. The trick is to find one with its remote (BTDT). There are said to be smartphone apps to emulate the KC-206 remote. Tony, Oh no I BUY WHEN i can either garage sale $1 bargains or get still in the shrink and brand new. . I dunno Lew, a Chromecast 2 can be had on ebay for 15 bucks, providing that's not a budget buster. TNTsTunes, do you still have that Sherbourn Audio Pre-1? Thanks.